While choosing a tripod that fits your needs is already complicated, choosing a travel tripod is even more so. That is why we took the time to rate what we would consider to be the 6 best DSLR travel tripods available. There is no better way to document your favorite trips than with beautiful photography. However, the slightest camera shake can ruin your images. This will in turn leave you remembering the annoyance of blurry photos rather than your actual travel. In this guide, we consider travel tripods from a number of different angles. Those include weight, height with the legs extended and collapsed, and durability. It also includes load capacity and stability. Tripods are more complicated than you may think. There are several different categories that they fit into. But there are also a number of different components available. They can completely change the functionality and purpose of your tripod. Here are some of the main considerations to look at when selecting your travel tripod. The three-way head is the most common. It has three control arms on the main body of the tripod head. The first two controls can be used to tilt your camera vertically or horizontally. The third allows you to pan with your camera. This head allows for precise adjustments and is easy to use. But if can be bulkier than other options. That makes them slightly less attractive if you want to travel with your tripod. The ball head, while being a relatively new type of equipment, is much more appealing for travel given its compact nature. This head has a ball (hence the name) surrounded by a round casing with a tightening knob. Given the simple design, these heads are quite easy to adjust quickly. That makes these tripods particularly versatile. Pistol Grip Heads are similar to ball heads. But the ball is adjusted by squeezing a trigger handle instead of tightening a knob. These tripods are perhaps the easiest to adjust. However, they don’t tend to come with as high of a weight capacity as other options. Do you plan on photographing wildlife while you travel? If so, this is definitely the way to go. Tripods are primarily made from one of three materials: wood, aluminum and carbon fiber. You can find tripods made from other materials like plastic, stronger metals like steel or exotic materials like basalt lava. But these will all be specialty tripods. We recommend sticking with one of the most commonly available, and thus most manufactured and perfected, materials when choosing a travel tripod. Back in the day, tripods were only made from wood. That gives wooden tripods today a classic, retro look. They tend to be very ecologically-friendly. They are also pleasant to handle in heat and cold. In addition to that, they are durable. They don’t corrode like aluminum tripods will. On the other hand, wooden tripods are heavier than either aluminum or carbon fiber ones. They don’t fold down to a compact size like the other two can. Aluminum tripods have hollow legs. So they can collapse in as you break them down. They also weigh significantly less than wooden ones. They are also durable and inexpensive while still offering a strong, solid support for your travel camera. Since they are made from metal however, they conduct heat more than wood and are likely to corrode if they get wet. Finally, carbon fiber tripods offer similar lightweight and collapsible features to aluminum tripods. They do that while offering better vibration dampening than metal. They are also tolerant of many temperatures and don’t corrode like wood. They combine the best of wood and aluminum. As a result, these tripods are more expensive and are unfortunately less durable under impact. The type of head and the material and thus overall weight of the tripod is important. All of this means nothing if you don’t have the appropriate load capacity. It is important to note that load capacity refers to the weight the tripod can support while remaining steady. That is not the weight it can hold before it breaks or collapses. This basically means that your tripod won’t splinter apart if your set up is a pound or two over the weight capacity. However, it will compromise the stability of your shot. The legs and the head both have different weight capabilities as well. You may be inclined to add these two numbers. However, you actually need to take the lower of the two. This means that if you have tripod legs with a load capacity of 30 pounds and a head with a load capacity of 20 pounds, the overall load capacity of your tripod is 20 pounds. Overloading a head will likely result in a slow, subtle movement once you have it your camera set up regardless of how much you tighten it. We recommend buying a tripod with a load capacity two or three times higher than your heaviest camera and lens setup. Given the number of factors to consider when selecting the best travel tripod for your needs, we tried to consider the range of tripods available from every angle we could think of. Is the tripod easy to pack? Is it light enough to carry on long walking trips? Is it still heavy enough to be stable for photographs in windy locations? Is it durable and well made? Does the price make this purchase high value? Here are the main components we looked at when ranking our top six DSLR travel tripods. Travel tripods don’t tend to extend quite as high as full-sized tripods. However, it is still important to have a tripod large enough to be functional. Tabletop tripods are obviously in a different category. But as a general rule you want your tripod to extend to about 50 inches. That way, it is a comfortable height when you are using it. If it is much shorter, you may find it uncomfortable since you will have to bend down significantly. It is also important to find a tripod that folds or collapses small enough to fit into carry-on bags. This means your tripod will have to store at less than 21 inches tall. That is the largest length most airlines allow for carry-on luggage. These tripods fit comfortably in a carry-on suitcase or a camera backpack. Weight is one of the most important considerations when choosing a travel tripod. That is not only because they can be cumbersome. It is also because it can take away from your travel experience if it tires you out and you hate carrying it. It may seem silly to note a half pound weight difference between tripods. However, every ounce counts when you have to carry a piece of equipment for travel. Carbon fiber and aluminum are the lightest materials used to make tripods other than cheaply made plastic ones. Wood is too heavy and doesn’t collapse or fold small enough to be a viable travel option. Therefore, we haven’t included any tripods made of wood on this list. Our first question when it comes to value has to do with quality. It is important to select a tripod with legs that will hold up when extended around salt water and mud without corroding quickly. The head should be compact, lightweight and strong enough to support your equipment. This often meant selecting carbon fiber, but given its higher price tag we also had to consider cost. It is important to get a high-quality piece of equipment. However, not everyone has the budget of a professional photographer. Taking this into consideration, we tried to select tripods that average consumers could afford. With this in mind, we still recommend staying away from the cheap, $20 tripods you can find at Walmart. These tend to have many plastic components. They will likely fall over or wobble. That puts your thousands of dollars of camera equipment screwed to the head in peril. If you’re going to spend the money on a travel tripod, a good general rule is to look for one that is at least $50 or more. Every tripod comes with a load capacity of what it should be able to hold. However, we looked for reviews that they actually held cameras steady under normal circumstances. In general, we wanted to find tripods that wouldn’t topple in reasonably windy circumstances. This is particularly difficult and important when it comes to travel tripods. They need to be both strong and lightweight. That is a combination that tends to cost more than standard tripods. We also wanted to select tripods that are stable with heavier DSLR cameras. Some are rated for higher load capacities. However, if they have a smaller ball head, it likely won’t be stable with bulkier, heavy DSLR cameras. Taking a trip, whether across town or across the world, is a great excuse to pull out your DSLR and capture beautiful photos to remember your trip by. In general, since photography is characterized by opening a lens for a small period of time to permit light to reach the sensor, you need to hold your camera as still as possible. If you are photographing at night or in other low light conditions, this becomes difficult to do without assistance. This is where a tripod comes in handy. Mounting your camera on a stable tripod at or near eye-level allows you to capture beautiful sunset, nighttime and other low-light shots. They would be impossible to do if you were holding your camera. If you don’t tend to take photos in low light when you travel, you’re probably good without a tripod. If you want the option to take dusk or sunset photos, you will kick yourself for not bringing one. Tripods can also be great for long exposure shots during the daytime or at night. A common example of this is a photography of a waterfall or moving clouds. The long exposure time creates the cotton candy water effect. That means the movement is clear in the water, but the rest of the image is sharply in focus. Can my tripod get wet? Most carbon fiber and aluminum tripods can be used in shallow water or mud. But it is imperative that you clean them well before folding them back up and storing them. Carbon fiber tripods will just get messy. However, aluminum ones can corrode if you leave salt and water on the legs. Make sure you carry a dry, clean microfiber cloth in your camera kit to wipe down the legs after each use. Even if you didn’t place your tripod in the ocean, it still could have collected dust, dirt and other things that may damage it from being used outside. Don’t use water or other cleaning fluids when wiping it down, either. Just a dry microfiber cloth will do. Once you are done using and cleaning your tripod, make sure the legs are not locked tightly. Also make sure the tightening bolts on the head are loose if your tripod has them. Storing your tripod with everything tightly locked could lead to damage. Try to keep it horizontal in a dark, dry place as well to avoid sun damage. How much do I really need to spend on my tripod? Tripods are available between $20 and over $500. However, you get what you pay for. You can take a gamble on cheaper, part-plastic tripods. But while you may have a great experience, your equipment may also fall and break. We recommend shopping around the $50 mark or higher. Many pros spend $500 or more on their tripod kit. But unless you are planning on using exceptionally heavy lenses or video cameras on your tripod, you definitely don’t need to spend this much. Make sure you check the lowest component load capacity, the heights, weight and reviews. That will help you ensure you are getting a sturdy base for a good price. It should serve you well. Are there any tripods I should avoid? Generally, extremely inexpensive tripods are not good tripods. Unfortunately, if you want a lightweight tripod that is also sturdy, it is going to cost more than $20. Going for the thinnest legs you can find with braces will also not serve you well. The braces stop the legs from spreading but do nothing in terms of stability. On the other end of the spectrum are extremely robust tripods with gigantic heads. You could roll a tank past these and they wouldn’t move an inch. These are ideal for studio work. However, you will not want to carry this for travel. Even if you think it will be fine, trust me, it will not. In general, travel photographers should look for a moderately priced tripod that is lightweight and sturdy that can collapse to less than 21 inches tall for transport. Make sure you have a good travel camera bag that you can at least carry on your shoulder since you won’t want to have to hand carry your tripod everywhere while travelling. There are even some wheeled bags available if you find you really have a hard time carrying so much equipment. What tripod height should I select? First, make sure you are checking the height of the tripod with the legs extended. Ideally, you want to get a tripod that is at least eye level with the legs open at the smallest setting. This allows for easy composition. It gives you length to play with if you are on uneven terrain outside while photographing. Travel tripods don’t always extend this tall. But it’s a good place to start if you are looking for a good tripod for your travel kit. To find your eye level height, subtract about 5 inches from your height. For instance, if you are 5 feet 7 inches, you want to look for a tripod that is at least 5 feet 2 inches when set on its skinniest setting. If you are trying to find the shortest reasonable tripod, you should also keep in mind that the head of the tripod will add about 4 inches. Your camera body will add between 3 and 5 inches to the overall height. All of this is an ideal. However, you may still need to compromise and be fine with stooping down a little bit. That is so you can accommodate the compact construction and lightweight nature you need for a travel tripod. Should I get a tripod with a center column? Some people think this adds more stability. However, we advise that you steer clear of tripods with a center column. If you already own one or end up purchasing one for other reasons, don’t use the center column. All this does is convert your tripod to a monopod. You can get that much cheaper if that is the piece of equipment you are looking for. Generally, 4-section legged tripods are the easiest to break down and pack for travel. Stability can be compromised more in aluminum than carbon fiber with so many leg sections. However, if you buy from a reputable brand and make sure the reviews are solid, you shouldn’t have an issue with this. You should also look for tripods that have multiple angle and independent positioning. These are ideal for the uneven ground you are likely to encounter while photographing outdoors. These are also ideal for macro photography of flowers or insects. They can allow you to lower your shutter speed to really get clear details. What are some reputable brands? Any tripod that is well made and well-reviewed is a good tripod. However, there are a few brands that have been around for a while. They turn out reliable products. A few of our favorites come from foreign companies that have been producing tripods for a number of decades. They have gotten design and production down to a science. The Italian company Manfrotto was founded in 1970. It has set the standard internationally for reliable, high value professional tripods ever since. They specialize in camera support like tripods, high performance lighting and other equipment. Generally, any tripod they make will be a good buy. The French company Gitzo was founded quite a bit earlier in 1917 by Arsene Gitzhoven. It started making tripods for French photographers in the late 1940s. They were the first to make tripods out of lightweight carbon fiber. They now have a full production facility in Italy. Again, any tripod from this manufacturer is likely to be reliable. There are many other companies that tend to be reliable, including MeFOTO, Dolica and Benro. Generally, make sure the product you are buying is reviewed well by real photographers with experience in the field. Our 6 best rated DSLR travel tripods will be rated in random order. Their weight, height when extended, height when stored and load capacity will be listed. We will then examine basic pros and cons, what makes each special, what reviewers had to say about each tripod and the features and considerations that you need to be sure to take into account when making your selection. Cons: Minimum height is over 1 foot and the plate the camera fastens to requires a screwdriver or coin to tighten. What Makes this Tripod Special? MeFOTO currently makes the same style tripod in three different materials – the Globetrotter (carbon fiber), the RoadTrip (aluminum) and the BackPacker (titanium). They are available in 9 different colors, ranging from classic black or dark grey to bright, cobalt blue, magenta purple and hot pink. While the aluminum is less expensive and the titanium folds smaller than the carbon fiber, the Globetrotter is our choice of the three styles. The legs slide into themselves to collapse, and there is a center column if you want to use your tripod as a monopod. While we don’t recommend using the center column while you are using your Globetrotter as a tripod, it can be nice to have two pieces of equipment in one should you find the need for a monopod. The tripod also comes with a handy carrying bag, which makes it handy when you are going on a walk and want to take your equipment or if you want to stow it away in your carry-on bag. The legs extend through a twist motion that tightens and loosens the segments instead of the more traditional flip lever that full-sized tripods prefer. This helps the tripod fold more compactly and allows you to extend the legs more quickly by twisting the fastenings simultaneously. The tripod also comes with a ball head that has an easy-to-use twist and pan mechanism. The pan feature on the head is smooth enough for sports and wildlife photographers to use. This is one of the best value tripods available. It comes with a high load capacity and weighs only 3.7 pounds but costs well under $200. It is easy to use and folds away small enough that it fits well inside all carry-on bags and is hardly noticeable on long walks. While there are more robust travel tripods available from other more established companies, this is one of the best value tripods available. While the bright colors don’t look particularly professional, this has actually been a positive for some photographers as it allowed them to photograph in areas that don’t allow commercial, professional photography. Overall, reviewers praised the MeFOTO Globetrotter for its easy-to-use features and simple mechanisms. The twist locks on the legs allow for fast set up, break down and adjustments, and the ball head allows for precise movements and fine-tunings to the camera position. The load capacity was also accurate, and there was no creeping once the camera was set up on the tripod. The legs have tightening mechanisms in two places – one at standard height and one very close to the ground. This can be annoying since you may have to bend down repeatedly, but it is not uncommon for tripods, so it is certainly not a reason to overlook this tripod. Another annoyance is the Arca Swiss plate that fastens to the camera that requires a screwdriver or similar tool to tighten. It is easy to add a small screwdriver to your kit though, or you could use a coin or the tip of a key if you forget to bring one. These plates are pretty standard as well however, meaning you may have to get used to using them regardless of inconvenience. Since the legs twist to loosen or lock, you can’t pick the tripod up by grabbing one leg when it is lying flat on the ground. This is likely to cause the tripod to start to collapse or expand. This is, again, a minor annoyance when compared with the other features and the price tag that this tripod offers. Cons: Bulky for a travel tripod and won’t fit into standard carry-on luggage. There are several features we enjoyed about this tripod. They contributed to the decision to include it on this list. That is despite the fact that it won’t fit into a standard carry-on bag. First, it can raise your camera higher than any other tripod on this list. It has a maximum height of 69.9 inches. Second, the legs have a unique feature where you can remove them from the setup. You can screw them onto the center column to form a monopod. While other tripods have a center column, this is unique and gives your equipment double functionality that can come in handy. The tripod is also constructed with 9 layers of carbon fiber to create a camera support that is strong, lightweight and holds up well under frequent use and travel. The legs have grip twist-lock mechanisms to clamp the collapsible sections similar to those on the MeFOTO Globetrotter, allowing easy set-up, tear down and adjustments during shooting. The design is closer to that of a full-size tripod, however. The load capacity is also high enough that the tripod can easily support any DSLR or mirrorless camera setup. Many of the features in this tripod make it slightly more cumbersome to travel with than other travel tripods and a little bit less robust than most full-sized tripods. 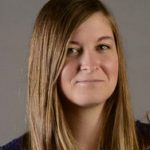 This can be an advantage however, as it can easily serve both purposes for photographers who don’t want to spend the money on two tripods and are looking for a good all-around tripod that can travel well but is solid enough to use in the studio or at home. If you are looking for a versatile piece of equipment, this is the best tripod on this list and is a great value for the cost. The load capacity on this tripod is high and it still only weighs 4 pounds despite the fact that it is one of the higher weight tripods on this list. The load capacity is also pretty accurate, and photographers didn’t report any slow slumping once the camera was set up on the tripod. While it doesn’t quite fit into a carry-on bag however, it can easily be strapped to the outside of a backpack or a camera bag. 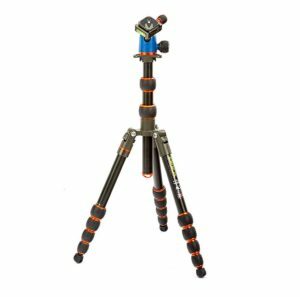 The full sized features make this tripod a joy to use at home or on travel and make this tripod unique among the 6 on this list. Even though this tripod is made of carbon fiber, it is still one of the heavier tripods on this list at 4 pounds. It also only folds down to 24.6 inches long, making it too long to fit into a carry-on bag and a little cumbersome to carry on long walks. It does extend taller than any other tripod on this list however, which, again, makes it great to use on travel or at home if you only want to purchase one tripod. The ball head has many high tech features since it is Arca-type compatible with coaxial friction adjustments for the main tightening knob, a separate panning lock to accommodate photographers who want to shoot wildlife or sports, a bubble level and a pull-and-twist safety release system that helps avoid accidentally dropping your camera set up. 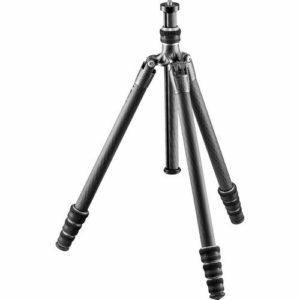 The main feature that sets this tripod apart from the other tripods on this list is the center column that can be quickly rolled into a 90-degree lateral shooting position, which is almost unheard of for travel tripods. Since it also has the lowest minimum shooting height on this list at just 2.75 inches, it is the best choice on this list for macro photography. While design isn’t as important as function, this tripod is certainly nice to look at. 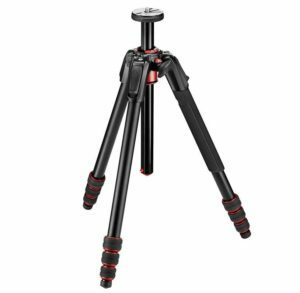 The leg locks are more decorative than most, and the entire tripod has snappy red accent marks that make it quite attractive. While the 3-way pan and tilt head isn’t as compact as the ball head, it does allow for very precise adjustments and makes this tripod great for panning shots. This is certainly one of the easiest tripods on this list to set up, allowing for quick, one handed extension when you are photographing. This can be invaluable when you are in the field taking photos on travel. While a lot of travel tripods have twist leg locks, these are particularly easy to grip and operate. While this tripod doesn’t hold up to the others on this list in terms of traditional travel tripod features, it is unique and well worth a second look. The load capacity, while low, is true, even when using the camera in a lateral position. You should still make sure you are close by in case the tripod tips while shooting laterally, since an accident could ruin your expensive camera setup. Reviewers also praised this tripod for how easy it is to set up, adjust and break down. The mechanisms that loose and tighten the legs and adjust the head are particularly easy to use and have decorative red accent features that make the tripod particularly attractive. While this isn’t a great all-around tripod for most photographers, it is hard to beat if you want to do any sort of macro photographer. It is also a great choice if you have a lighter-weight mirrorless camera since the range is impressive for a travel tripod, extending from 2.75 inches at the lowest point to 61.4 inches on the higher end. With a lighter weight camera like mirrorless cameras, the 13.2-pound load capacity should not be a problem. If you don’t plan on doing macro photography and you have a traditional, heavier DSLR however, we recommend you look at the other 5 tripods on this list. With aluminum being one of the lightest weight materials available for tripods, it is a little ironic that this is the heaviest tripod on this list at 4.6 pounds. Also, ironically, it has the lowest load capacity at just 13.2 pounds, meaning you will need a different tripod if you plan on shooting wildlife, storms, sports or action photography with a telephoto lens. It is also just over 21 inches, meaning you may have a tough time fitting it comfortably in carry-on luggage. What the Manfrotto 190go lacks in load capacity and weight however, it makes up for in uniqueness. If you want to do macro photography on travel, you really have to look at this tripod since it is one of the only travel tripods with the ability to shoot in a lateral position. One of the most notable features of this tripod is the difference between its own weight and the load capacity it can support. At just 3.4 pounds, it is surprising that the 3 Legged Think Punks Corey tripod can support a 30-pound load capacity. It is also lightweight rubber, aluminum and titanium. That provides a tripod that is strong and durable throughout regular use. The legs have 5 segments that collapse inside one another via a twisting lock mechanism that is easy to use. The locks have rubber grips that are easy to twist. The manufacturer designed them with an alligator skin pattern that makes it distinctive and attractive. The legs also lock in three different positions that help alter the height of the overall tripod. Those are 23 degrees, 55 degrees and 80 degrees. That gives the tripod a height range of 4 inches to 58 inches. 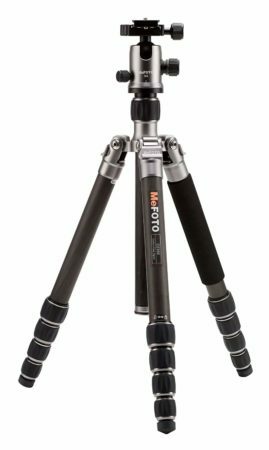 The load capacity and the lightweight nature of this tripod make it appealing and unique. The AirHed Neo ball head is certainly strong enough and high enough quality that the tripod really lives up to the capacity it is rated for as well. These features make this tripod particularly great for travel, and the unique central column design allows the tripod to sit really close to the ground for unusual or macro photos. Reviewers were pretty split on the design of this tripod, with some liking the decorative features and others finding them gaudy and over the top. The aluminum, titanium and rubber used to construct it are high quality and durable through regular use though. The tripod also folds small enough to comfortably fit in almost any bag, with the smallest folded length on this list at just 13.7 inches. 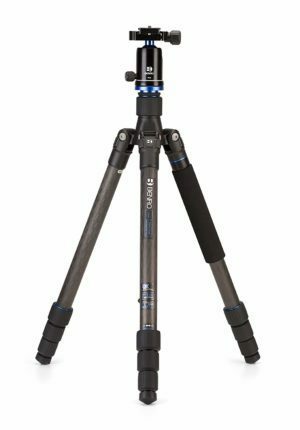 Overall, reviewers found this tripod to be reliable and a great value for all of the features it came with. The main note was that you may want a tripod that extends beyond 58 inches if you are taller, and this isn’t the best choice if you want quick set up and tear down since removing and reattaching the central column and ball head can be time consuming. While many of the design features are unique and attractive to most, they certainly are different than the classic, sleek tripod look. The alligator skin pattern on the twisting lock grips on the legs are a good example of this. While many people like the uniqueness, some find these touches to be over the top and prefer a more classic design, like the other tripods on this list. While the tripod is pretty true to its 30-pound load capacity, it is definitely more susceptible to shake at its maximum height of 58 inches. This is pretty standard for tripods however, and certainly shouldn’t factor too heavily in your decision. The tripod also has a unique design feature where the central column can be removed to convert it into a monopod with one of the legs. You should note that you have to remove this central column to allow the tripod to reach its minimum height of 4 inches, which can be time consuming and cumbersome. Once you remove the central column you have to screw the ball head directly onto the tripod itself. The ball head comes with a bubble level for ensuring that your shot is level, and the spring loaded legs are usable even when the legs are folded around the central column, which is relatively unique. Load Capacity: approximately 40 lbs. This tripod is the best value on this list, with the highest load capacity of the 6 tripods we selected and one of the lowest weights. At just around $100, this tripod certainly offers high utility for a comparatively low price tag. It also has the second highest maximum height on this list at 65 inches. Like many of the other tripods on this list, the Zomei Z818 can convert into a monopod if you want to use it as such. The screw locks on the legs, the center hook and the monopod functionality are actually very similar to the MeFOTO globetrotter. The main difference between the two is the price and the fact that the Zomei is slightly heavier than the MeFOTO. It is relatively easy to set up, adjust and break down, and the four leg segments allow for precise height adjustments. The black design with metallic colored accents also results in an overall look that is classic yet modern. While design is certainly less important than functionality, this tripod has a look that is certainly more appealing than some of the other tripods on this list. Since it folds to 18 inches for storage and only weighs 3.7 pounds, it is one of the most portable on this list. This allows it to fit in any bag or backpack and allows it to strap easily to any camera backpack for walking or hiking trips. While there are a number of attractive features on this tripod, it doesn’t offer many unique elements. Other manufacturers make models that are remarkably similar. What the Zomei lacks in originality however, it makes up for in price, with one of the lower price tags for a reliable travel tripod. 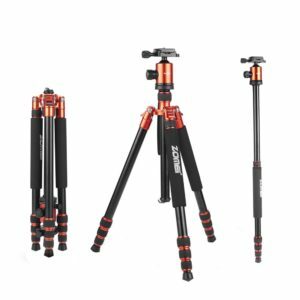 The magnesium and aluminum alloy tubes have anti-corrosion coatings, which allows the tripod to hold up through regular use in various outdoor conditions. The three leg angle positioning also allows photographers to position the tripod in more convenient, varied positions and accommodates irregular outdoor surfaces well. The high load capacity makes it a good option for sports, weddings and outdoor action photography as well. The quick release mounting plate makes it particularly easy and convenient to set up, and the rotating leg locks are easy to use as well. This is one of the best tripods for beginner DSLR users who want high functionality without breaking the bank on a professional tripod. While the Zomei has a rough load capacity of 40 pounds, which is the highest on this list, this isn’t an official load capacity. Photographers also noted more significant wobble with heavier loads than other tripods, which suggests this load capacity may not be entirely reliable. This tripod handles uneven surfaces well. However, photographers will have to get used to setting up the legs to account for different heights. It is good for travel. However, it is particularly good for hiking given these features. If you don’t tend to hike when you travel, however, or have a heavier camera with a telephoto lens, this tripod is likely to creep slowly downwards when you use it. If you want the best tripod that money can buy, it is really hard to beat this tripod. It certainly costs more than the other tripods on this list but is worth it if you want a professional tripod that will outlast you. This is one of the lightest, most intuitive, sturdiest tripods on the market, and looks sleek enough to compliment any camera set up you have. While the Gitzo doesn’t have innovative, futuristic features, every component is highly engineered and impeccably made. The tripod is super high-grade carbon fiber that is a step above other carbon fiber tripods. That makes it strong, lightweight and vibration-resistant. The legs have four sections that lock in position through Gitzo’s proprietary G Lock System, which is inconspicuous and convenient. They also add to the sleek, attractive design of the overall tripod. The Gitzo has the lowest weight on this list, at just 2.3 pounds, and folds down to 16.7 inches to easily fit in any travel bag or backpack. It also has a load capacity of 22 pounds, which is accurate. The minimum height of 8.6 inches also means you can use this tripod for Macro photography. While the standard model doesn’t come with a ball head, you can pay extra to add this feature. Overall, this tripod is narrower than other travel tripods. Gitzo sells individual components so you can replace pieces if they get damaged or wear out without having to replace the entire tripod. Most reviewers had a hard time finding negative features about this tripod beyond the high price tag, and found it to be reliable, strong, lightweight and easily portable. They particularly praised the classic, sleek design and the extremely light weight. Not only is this tripod the lightest on this list, but it is lighter than the next lightest tripod by over a pound. The tripod works particularly well in rain, snow or in the ocean, with the carbon fiber being particularly resistant to weather damage. It is still important to clean the tripod however to prevent it from accumulating dirt and salt. Reviewers also noted that the leg locks and head lock were particularly easy and intuitive to operate even in adverse conditions. The only downside reviewers noted was the lightweight construction, while handy for long walks, felt a little flimsy in overly windy conditions. A more robust, sturdy tripod may be preferable in these situations, but it will be much more cumbersome to transport and carry. While this tripod is certainly the best on the market, the high price tag is a deterrent to all but the most serious of professional photographers. While this is certainly one of the lightest travel tripods on the market, there are other tripods that have a weight below 3 or 4 pounds that are easy to carry or strap to your equipment. The rapid center column design comes with a locking collar above the tripod chassis that makes it simple to adjust the tripod column quickly, and a grooved design that prevents the column from rotating on its own. This overall design makes the tripod particularly stable and resistant to vibrations. The reversible center column allows for easy inversion as well and allows photographers to use the camera for macro photography. You can also remove the center column to shoot very close to the ground. The design is unique in that it doesn’t require any tools, making this one of the simplest designs to use in the field. The counterweight hook on the bottom of the center column enables photographers to add a weight to increase stability if you have a particularly heavy set up or are photographing in windy conditions. The Anti Leg Rotation system also allows you to set up the tripod in less than 15 seconds. You can loosen all three legs being with a single wrist movement. Perhaps most notable is the six-layer carbon fiber construction, which creates a tripod that has a flexible yet rigid design, above average vibration resistance and structural integrity. It also comes with a black dust bag that makes it easy to transport and store.